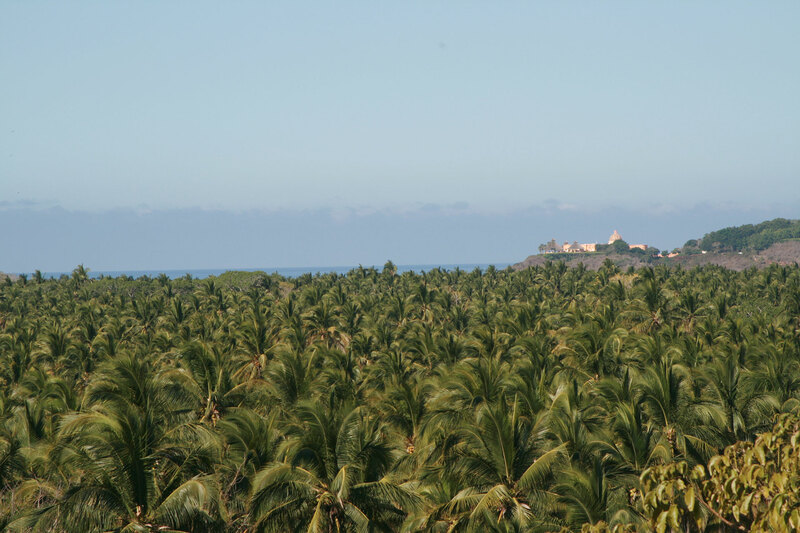 Spectacularly secluded property in a biosphere reserve, with miles of virgin beaches and palm groves. 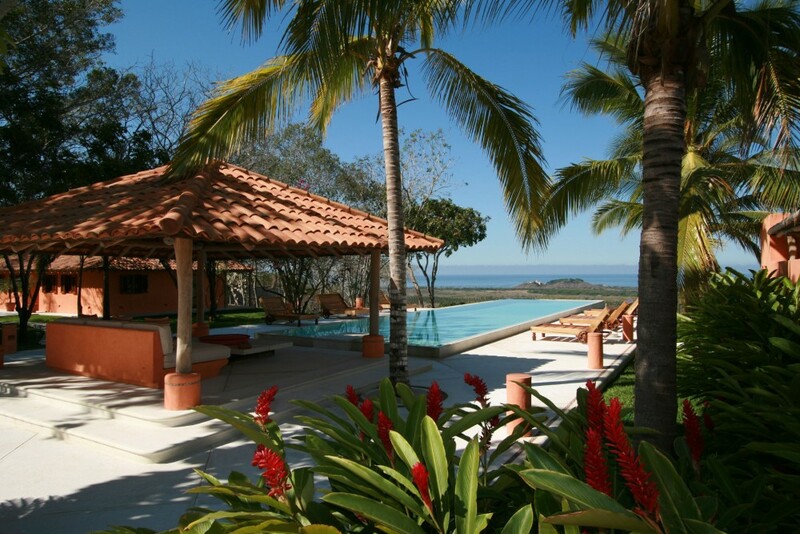 Luxury villas with private pools and one to three bedroom casitas. Great for secluded honeymoons or family adventures. Car rental required, beautiful private beaches a short drive away. 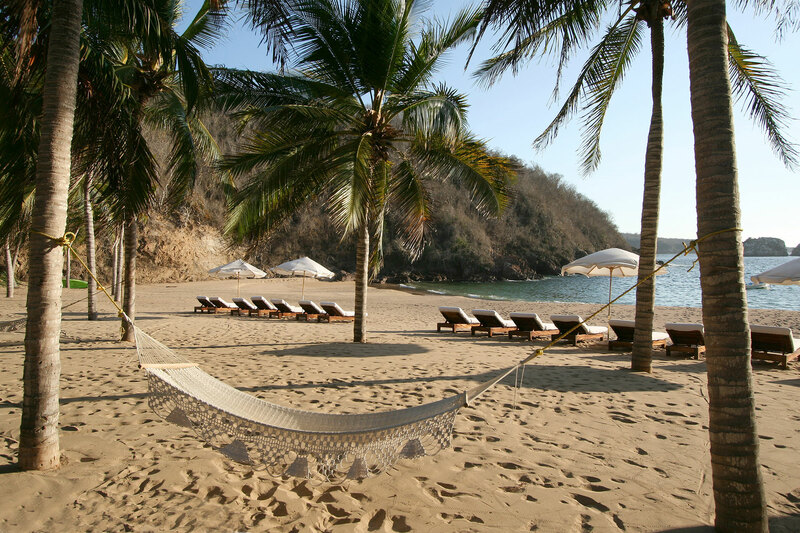 This spectacularly secluded resort lies in an estate covering 25,000 acres and includes the ecologically important Chamela-Cuixmala Biosphere Reserve. Cuixmala was once the private hideaway of Sir James Goldsmith, and is still owned and managed by the Goldsmith family. 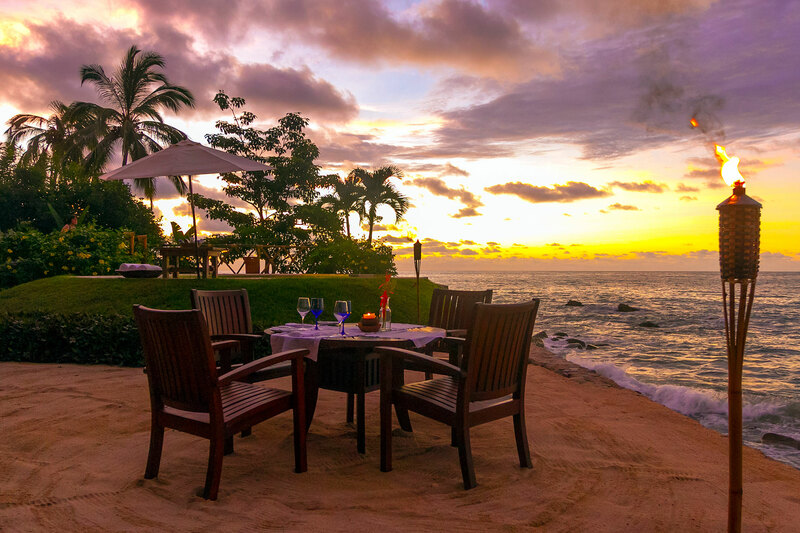 Those looking for exclusivity, privacy and exceptional service can take their pick of the nine casitas (sleeping from two to six people) or the fabulous fully-staffed villas, including La Loma, Goldsmith’s former residence. 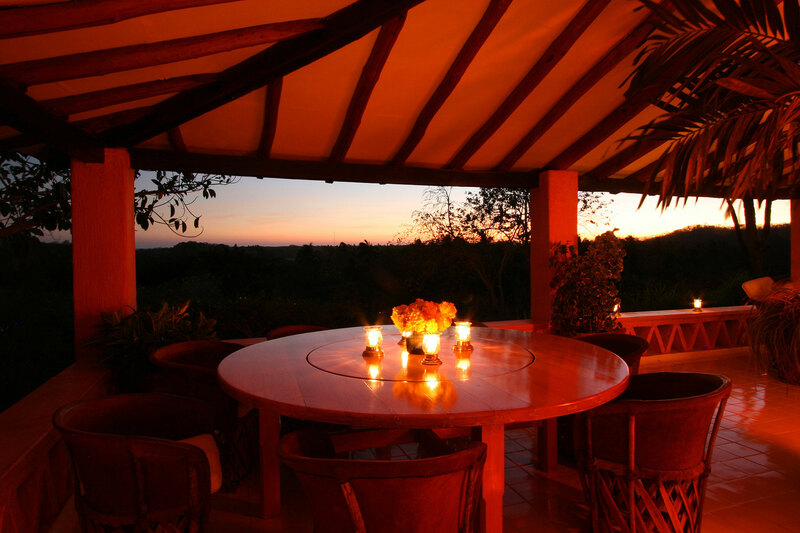 The casitas are clustered around a large swimming pool and are close to the restaurant Casa Gomez. Breakfast (included in the rates if you stay in the casitas) and other meals are served on the terraces of Casa Gomez, where guests can enjoy spectacular vistas over the estate. Menus feature organic produce from the estate’s ranch, including superb coffee. 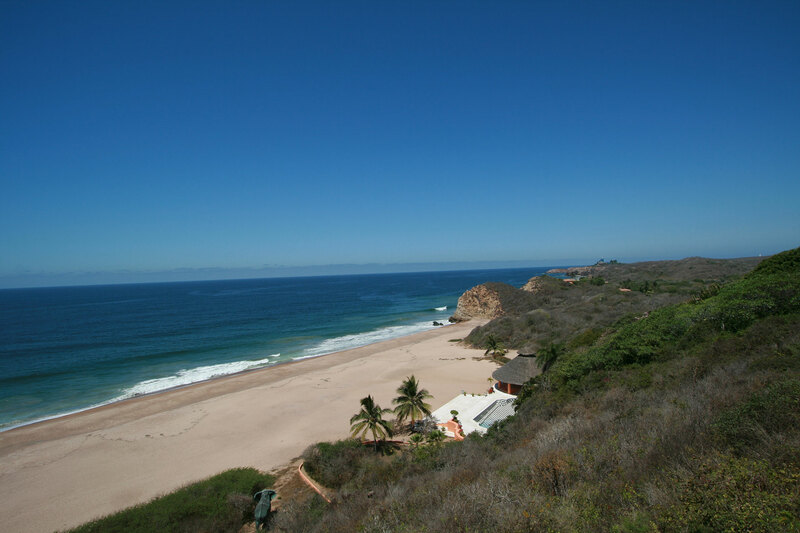 To get the most out of your stay at Cuixmala, we recommend having a rental car; in fact it is almost essential. It’s possible – indeed very enjoyable – to relax in your casita for a whole week, wandering on foot to the pool and restaurant. But the estate is so spectacularly beautiful that you’ll be enticed to explore it as soon as you look out from your window on the first morning, and it’s so vast that to do this requires wheels rather than feet. Miles of virgin beaches edge the estate. The best beach for swimming is at Caleta Blanca, thirty minutes away by car but well worth the journey. 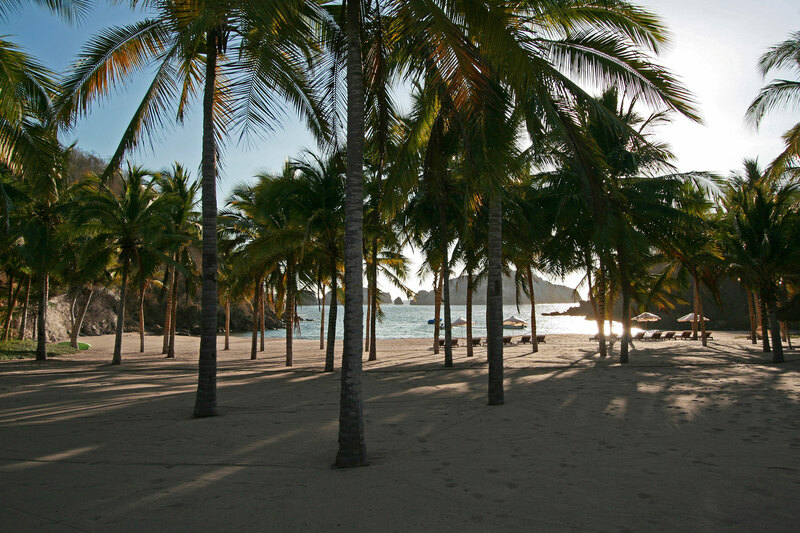 This private beach is incredibly beautiful, and guests are likely to have it to themselves. Driving through the tropical forests you may glimpse wild boar, coati mundis, white tailed deer, gazelle and antelope. 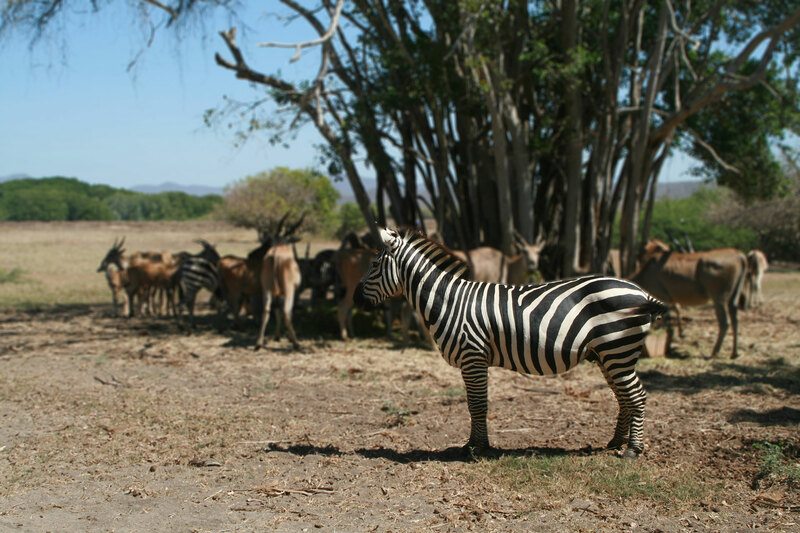 There are even zebra, imported by Sir James Goldsmith and living and breeding happily in these exceptional surroundings. Golf, scuba, polo and surfing can be enjoyed nearby, and mountain bicycles and binoculars for birdwatching are available for guests use. Horseback riding can be arranged at the well equipped stables, and there’s even a soccer pitch on the property. The accommodations at Cuixmala are divided into casitas and villas. The villas are three or four bedroom houses with private swimming pools; each one fully staffed and very secluded. The casitas are smaller cottages with one to three bedrooms that operate more like a boutique hotel. There are a total of nine casitas, clustered together around a large swimming pool. 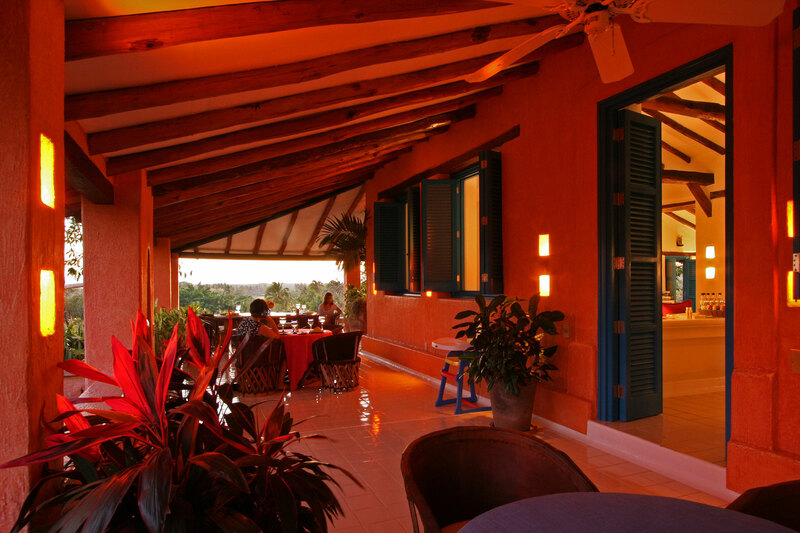 The club house “Casa Gomez” functions as a restaurant, reception and information point for the casita residents. Breakfast is included in the rates if you stay in the casitas, and this gives you the opportunity to meet with other guests or to catch up with the latest events (including the activities of the local turtle population; both green turtles and leatherback turtles lay their eggs on the protected beaches of the estate). 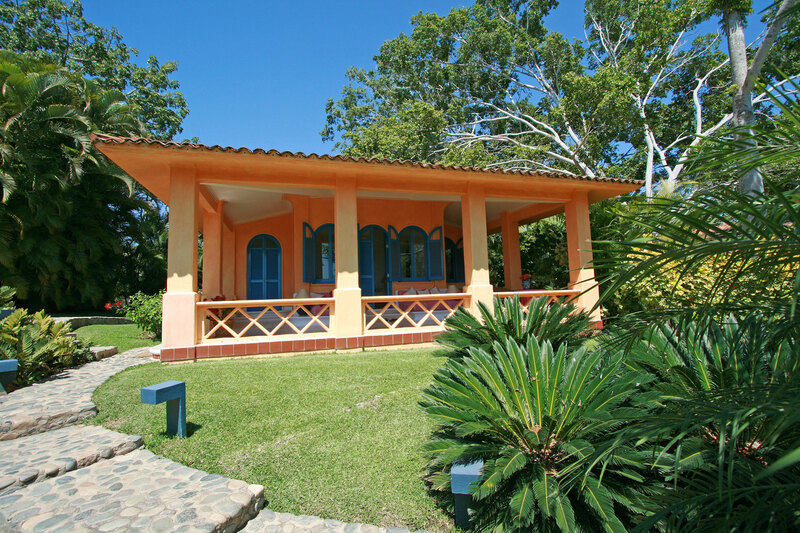 Five of the casitas have one bedroom and are suitable for two adults, or a couple with an infant or baby. 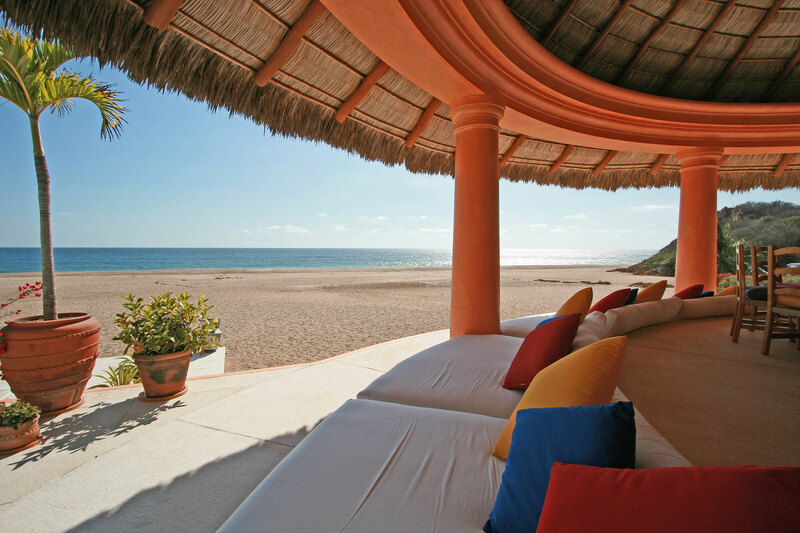 There are also three casitas with two bedrooms, and one with three bedrooms. 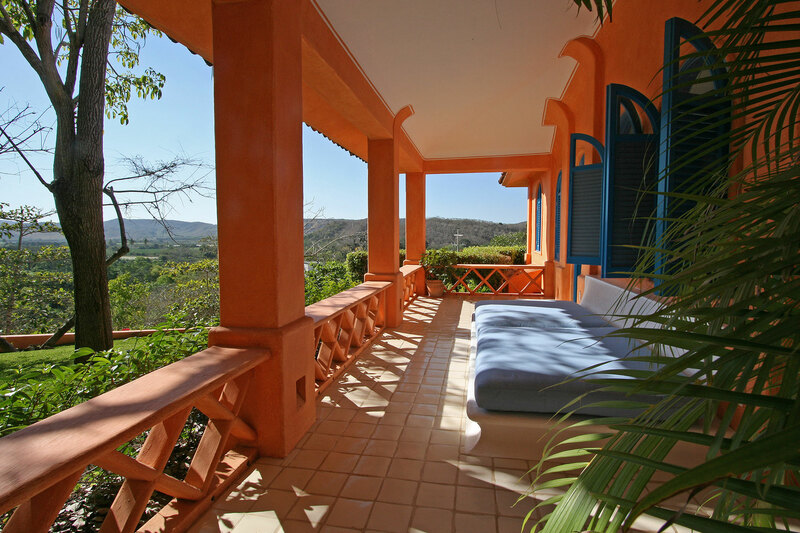 Each has a large terrace with far reaching views over the estate, furnished with day beds, tables and chairs. This outdoor living room is most guests’ favorite place to relax, but there’s also a living room (in the two or three bedroom casitas) or small TV room in the one bedroom casitas, complete with a DVD player. The casitas have air-conditioning in the bedrooms and each has a refrigerator. 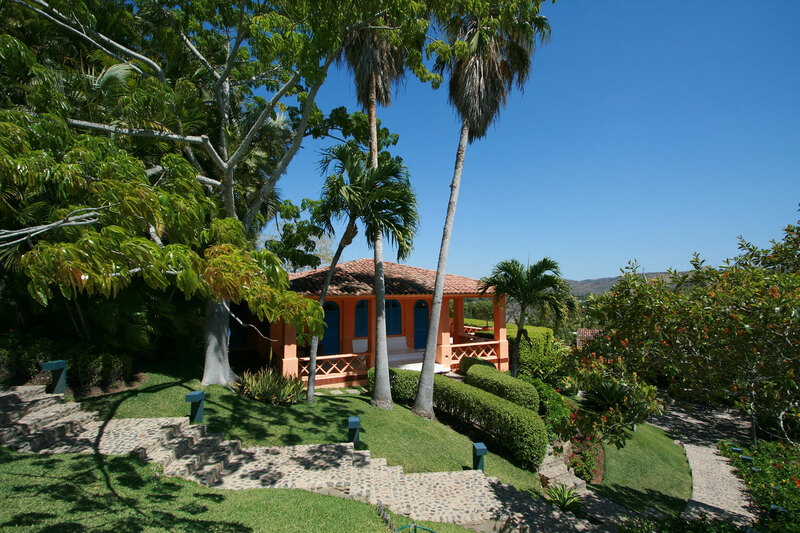 The villas range in size from three bedrooms (Casa Puma) to La Loma, which has four bedrooms in the main house and a further seven bedrooms in the adjacent bungalows. 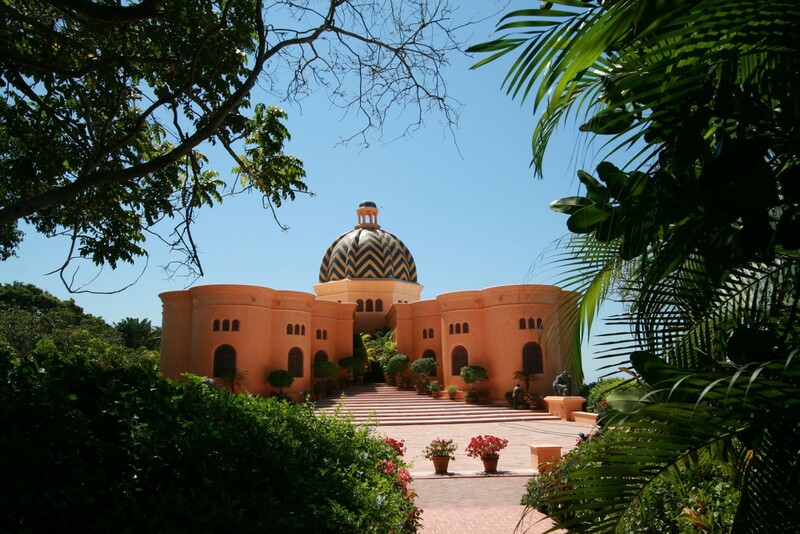 La Loma is the most palatial and is ideal for weddings and events. 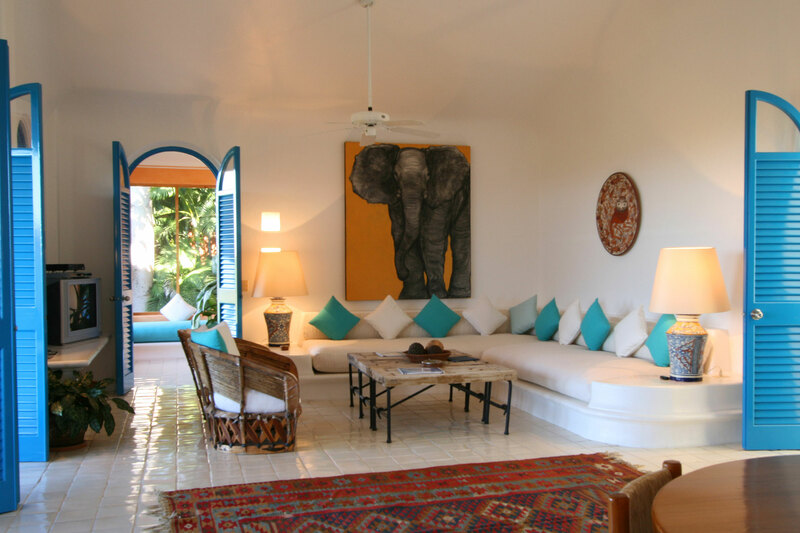 The other three villas are a wonderful choice for families or groups of friends travelling together. All the villas are fully staffed and a meal plan is available. 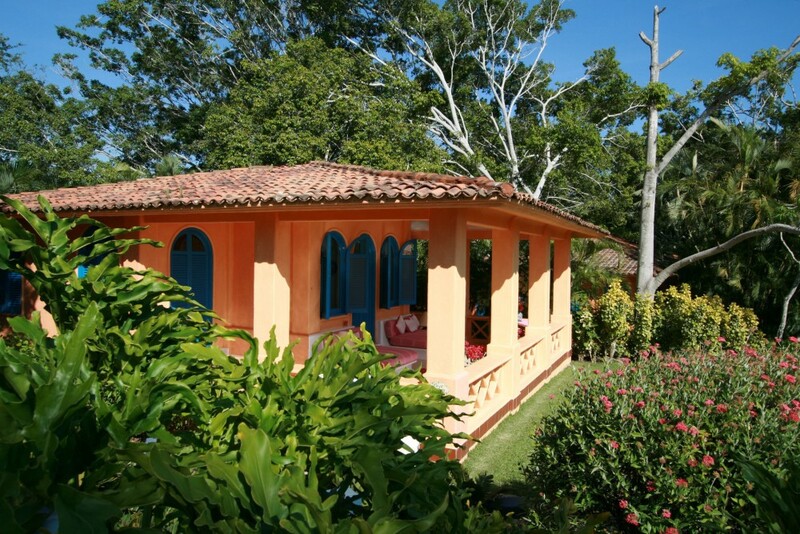 The one bedroom casitas are independent little houses nestled in the gardens around the swimming pool. They are located on a hillside, with steps down to the swimming pool. Some have a back entrance to an access road where vehicles may be parked, but in general these casitas are not suitable for those who cannot manage more than a few stairs. 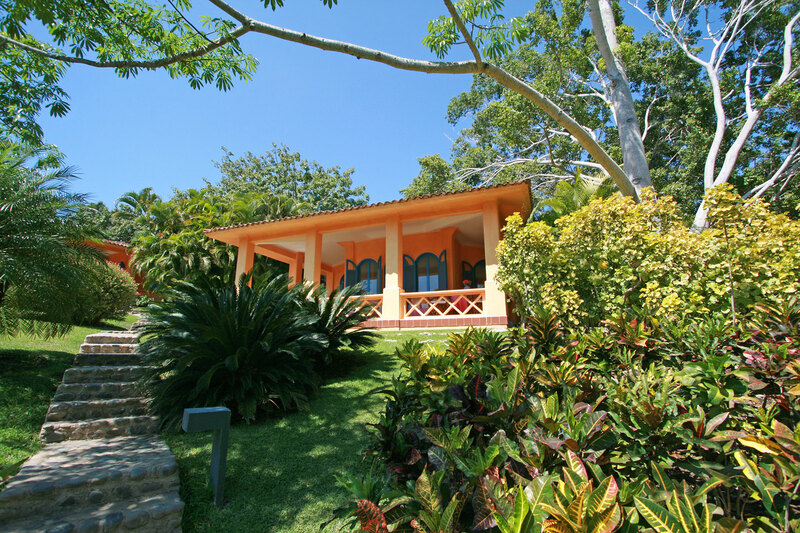 All around the casitas are tropical shrubs and flowers, lush lawns and tall trees. 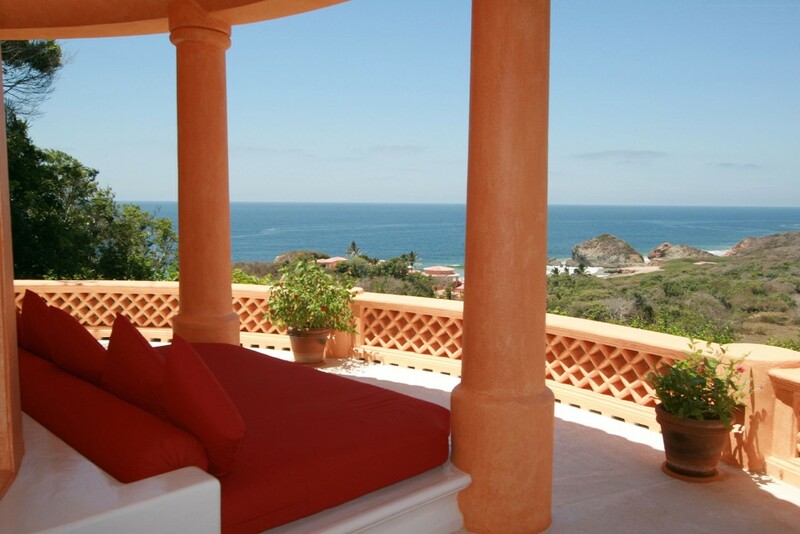 From the terrace, the one bedroom casitas open up into a large bedroom. The windows are shuttered on the outside, so it’s best to close the shutters before retiring for the night. Inside the bedroom, one door opens to a small TV room and another to a large dressing area and bathroom. 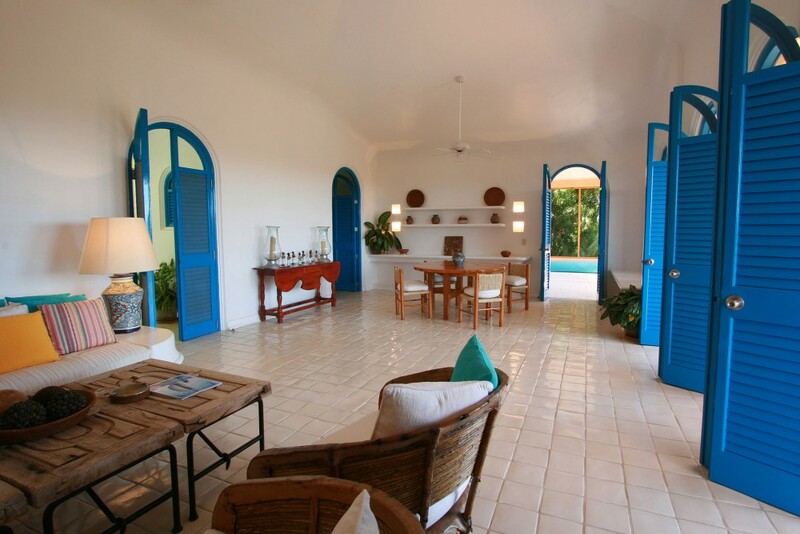 The casitas are simply furnished with cool tiled floors and white walls. The bedroom is air-conditioned and there is also a ceiling fan. The refrigerator and a coffee maker are located in the TV room and the telephone in the bedroom. The large dressing room has an open closet and plenty of space for luggage storage. Bathrobes, laundry lists and a room safe are provided. 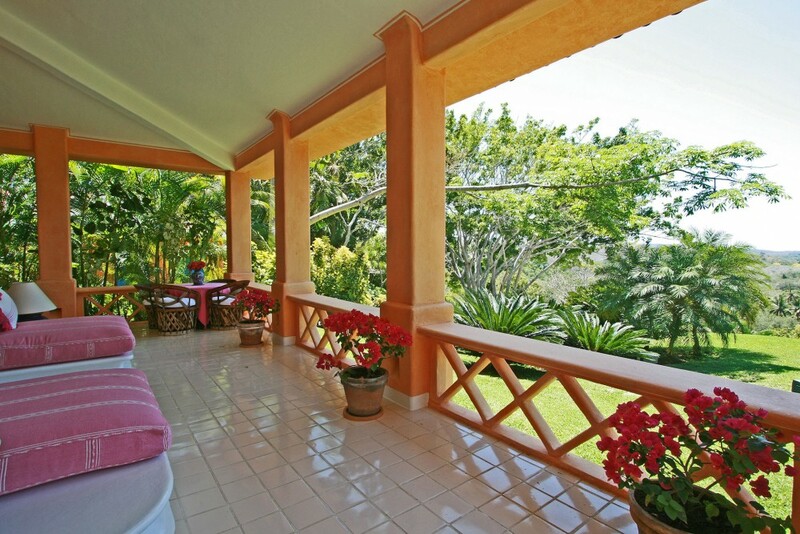 Casitas Hibiscus and Copa de Oro both have two bedrooms and two bathrooms. 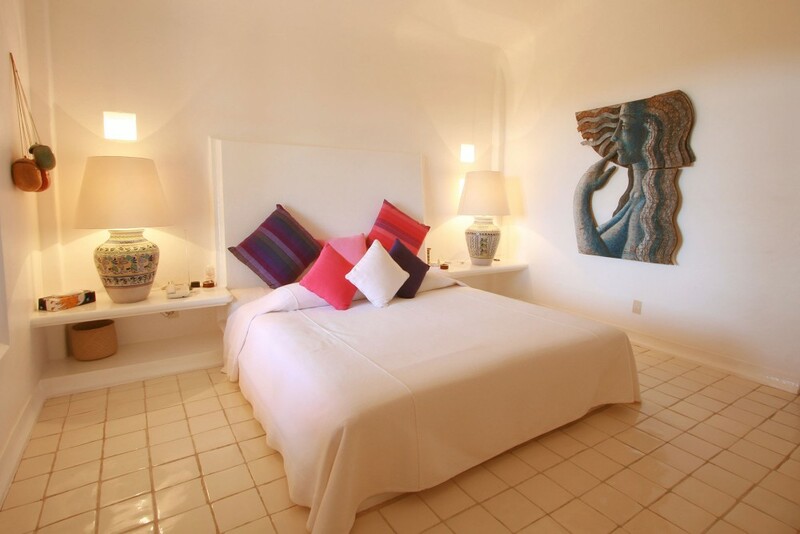 In Casita Hibiscus, both bedrooms have a king bed and en-suite bathroom. In Casita Copo de Oro one bedroom has a king bed and the other has two queen beds; both bedrooms have en-suite bathrooms. The third casita, Girasol, has two bedrooms, each with a king bed, sharing one bathroom. Casita Hibiscus has a large living room – a common feature of all the two bedroom casitas – furnished with sofas and a dining table, plus a full kitchen. The two bedrooms lie to either side of the living room. 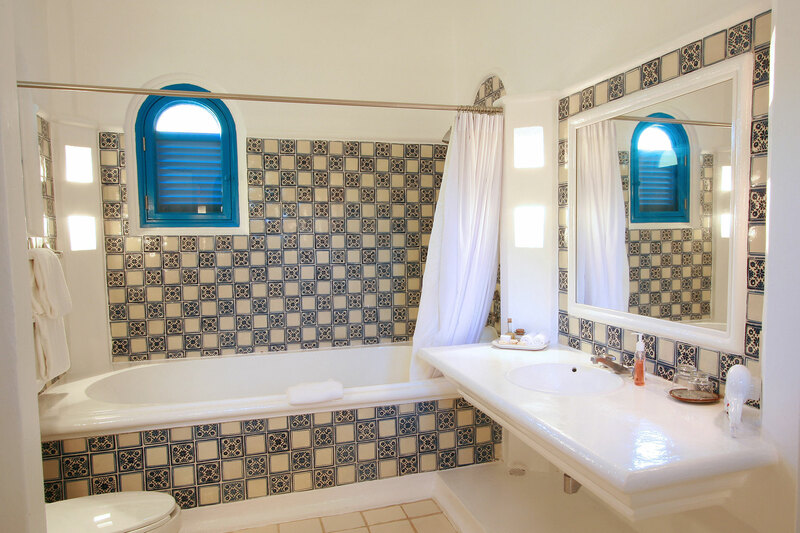 Each bedroom in Casita Hibiscus has a spacious en-suite bathroom featuring a large oval tub with a shower above. Each bedroom is fitted with an air-conditioning unit and also has a ceiling fan. 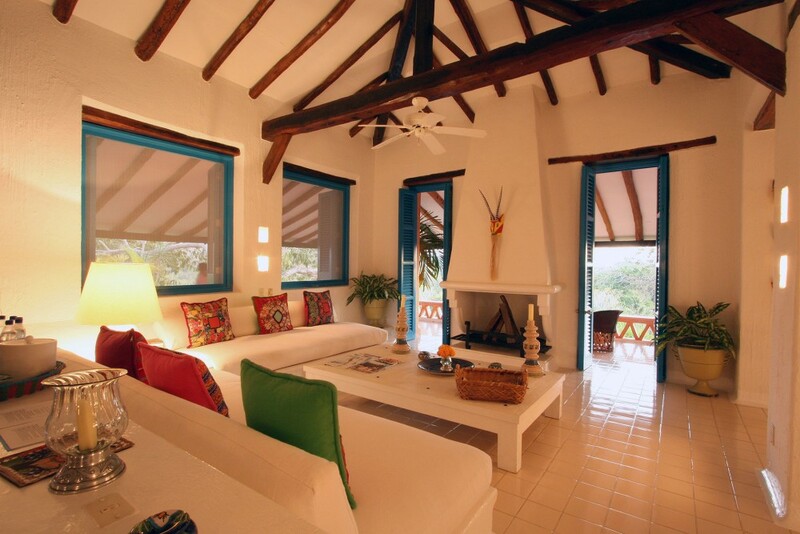 In Casita Hibiscus there are three terraces; one that opens up from the sitting room and one for each bedroom. In this casita the terraces are screened. 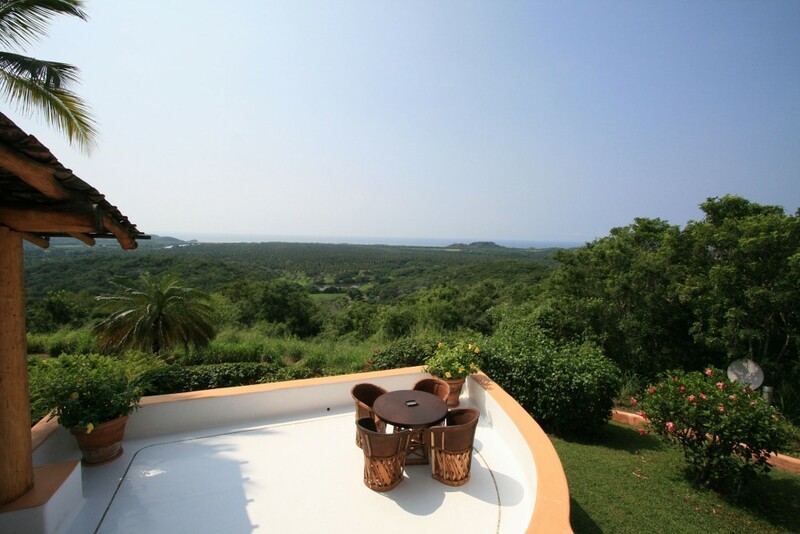 There are magnificent, far reaching views over the estate with the ocean just visible on the horizon. 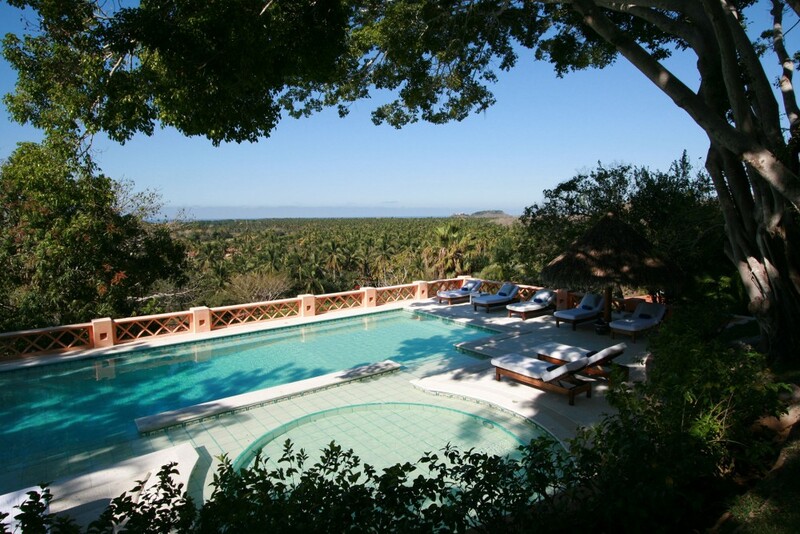 Casita Girasol lies closest to the swimming pool and is ideal for families. It has three bedrooms, one with a king bed and en-suite bathroom, and two further bedrooms (one with two single beds and one with a king bed) that share a further bathroom. 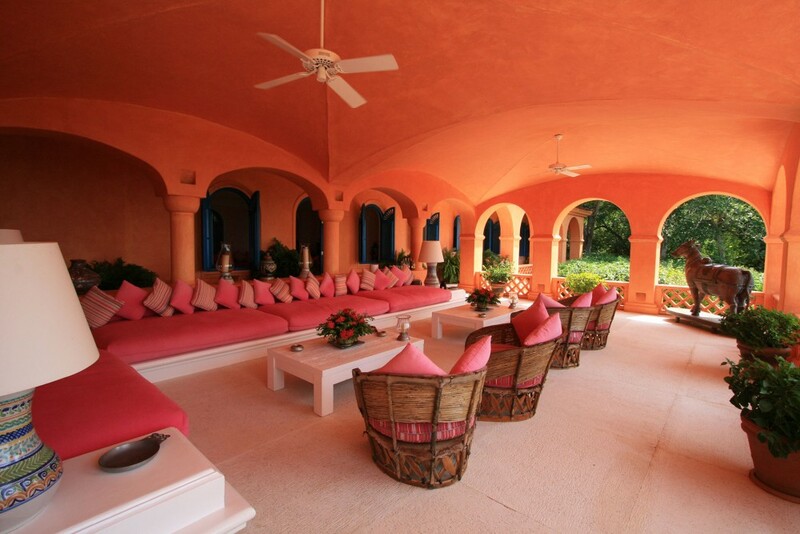 A spacious sitting room opens out onto a large terrace, facing towards the pool. This room has ample seating for a family. A large refrigerator is located in the kitchen. The casitas are not intended for self catering, but families with young children might find it convenient to prepare snacks for the children here. 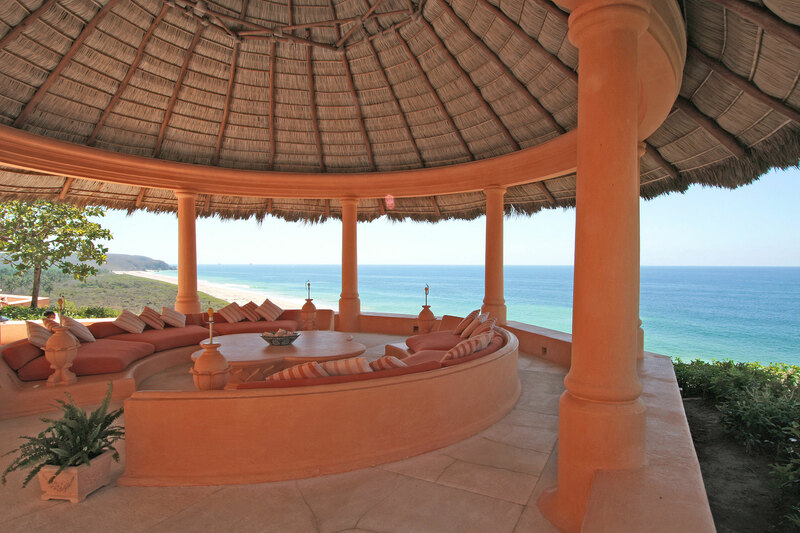 The terrace to the front of the casita has two large daybeds and vistas over the estate towards the ocean in the distance. A second terrace is accessed from the master bedroom and has jungle views; this terrace is blissfully sunny in the mornings. The master bedroom is very generously sized and features a long sofa bench. The bathroom has a large, oval shaped tub and a dressing room. The second king bedroom faces the front of the casita and has direct access to the main terrace. The third bedroom has two head-to-head single beds in the corner of the room and lots of closet space. 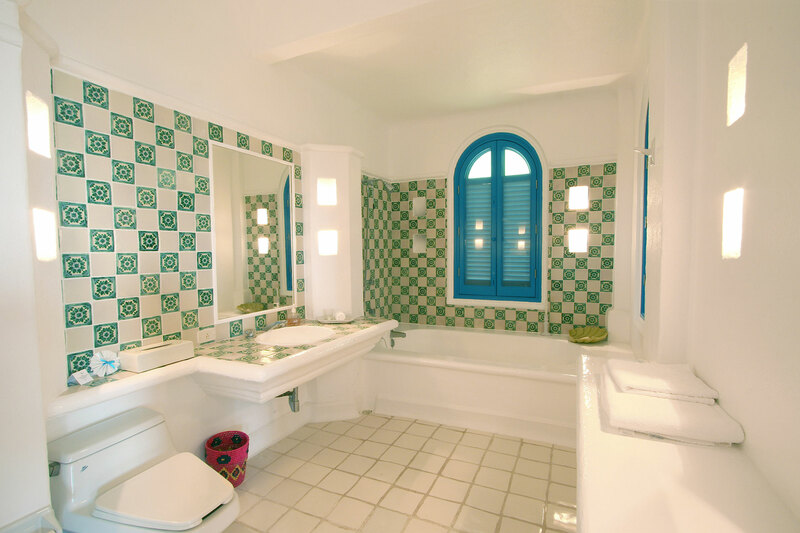 The second bathroom is a small shower room that opens off the hallway and is adjacent to a half-bathroom. La Loma has a spectacular location on a bluff, overlooking the miles of virgin beaches on the Cuixmala estate. This is the grandest and most opulently furnished of all the villas and includes magnificent reception rooms, indoor and outdoor dining areas and beach facilities that are exclusively for the use of guests at la Loma. The main house has four bedrooms, each with ensuite bathroom. 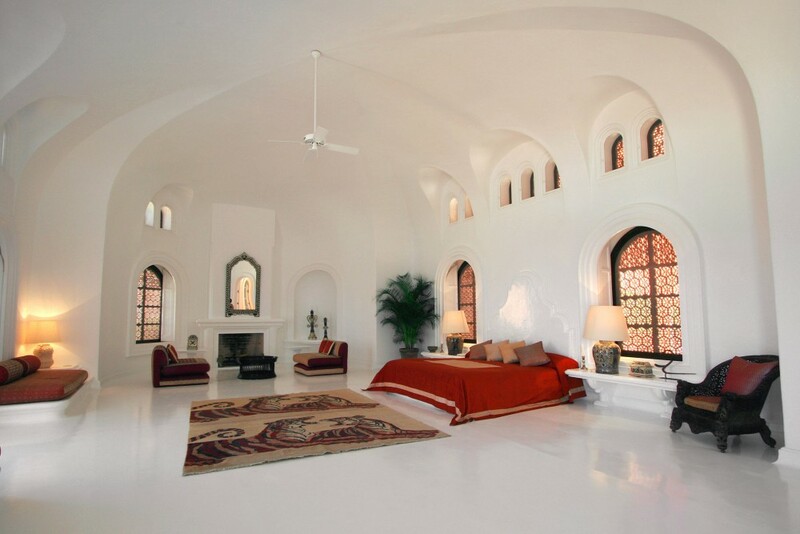 Each room is palatial in size; bedrooms feature large open fireplaces and sofas. 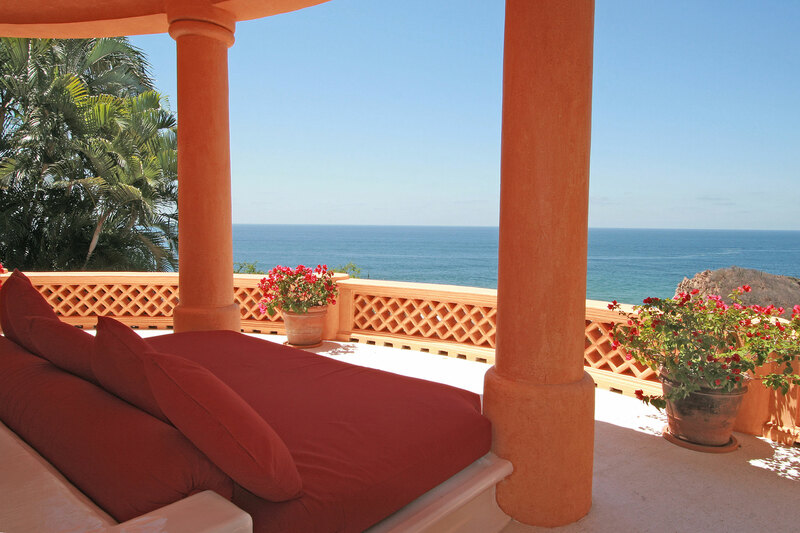 The master bedroom has a balcony with a plunge pool that enjoys elevated views of the beach. 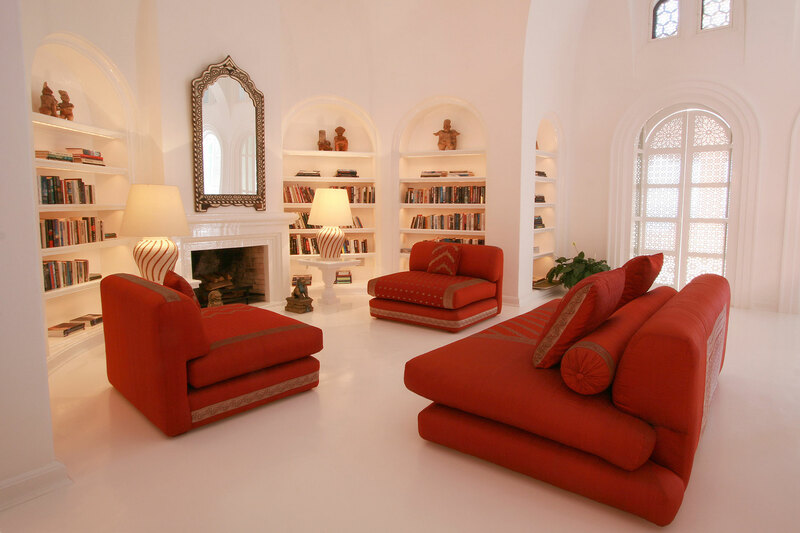 There is a magnificent dining room, a beautifully spacious sitting room and a welcoming library. 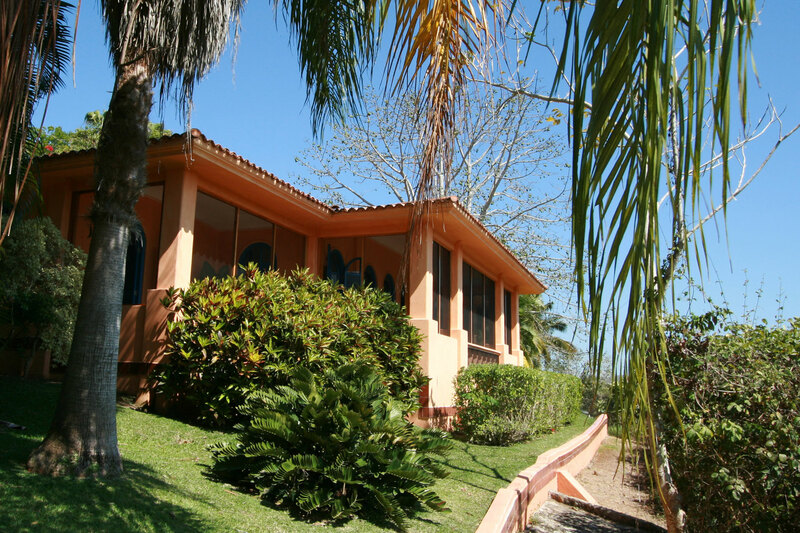 La Loma also features a large cinema room and guests have access to a generously stocked movie library. A series of steps lead down from the main house to the beach area and swimming pool (vehicle access is also possible). The large seawater pool is virtually on the beach, so that guests can admire the powerful surf from the calm waters of the pool. This beach generally has “red flag” conditions, but there are other swimming beaches on the estate. Additional guests can be accommodated in the six bungalows that are close to la Loma. Each is an independent little house with a bedroom, bathroom and a terrace. Some of the bungalows have ocean views. One of the bungalows has two bedrooms, so the total number of guests can be accommodated in the bungalows is 14, and the total in la Loma is 22. Casa Puma is a three bedroom villa with its own stunning swimming pool. The villa has breathtaking views over the estate, as far as la Loma and the coastline. Casa Puma has three bedrooms. The master bedroom has a king bed; a second bedroom also has a king bed, and the third bedroom has two queen size beds. 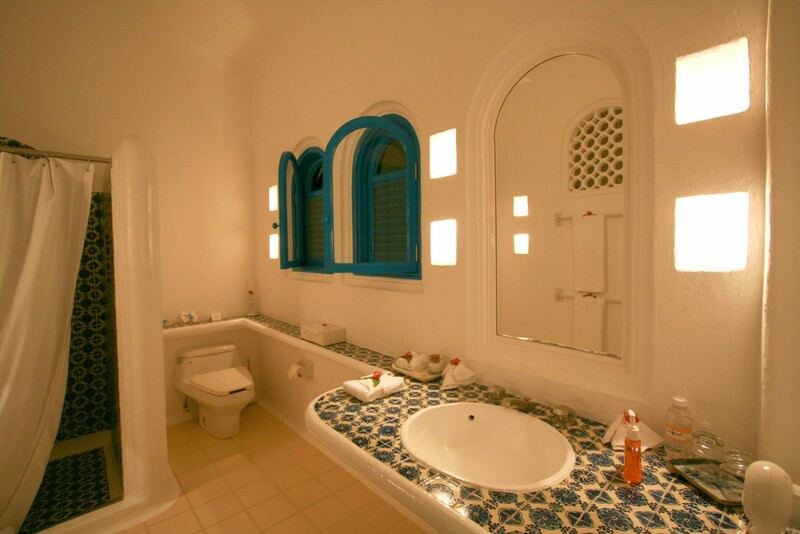 Each bedroom has a private bathroom and is air-conditioned. In addition, there are indoor and outdoor sitting rooms and a dining room. 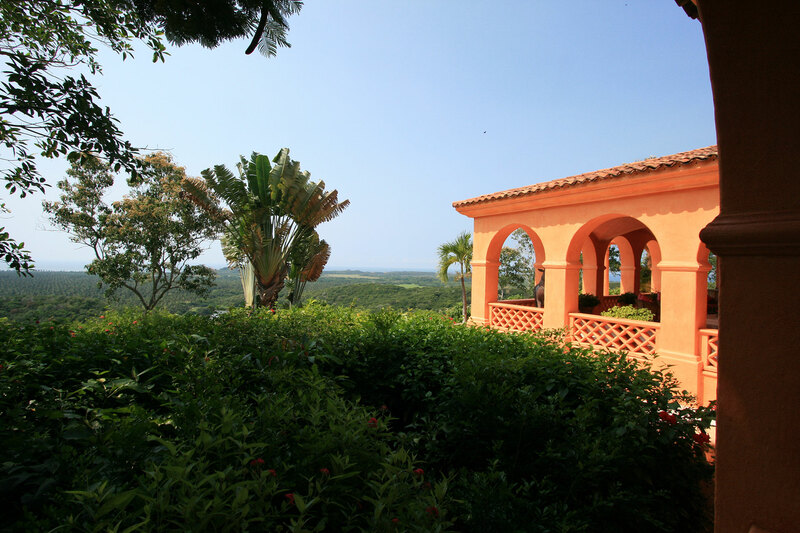 This villa has extensive terraces from which guests can take in the beautiful views. The swimming pool is surrounded by comfortable sun loungers and there is plenty of space for a family to relax together. 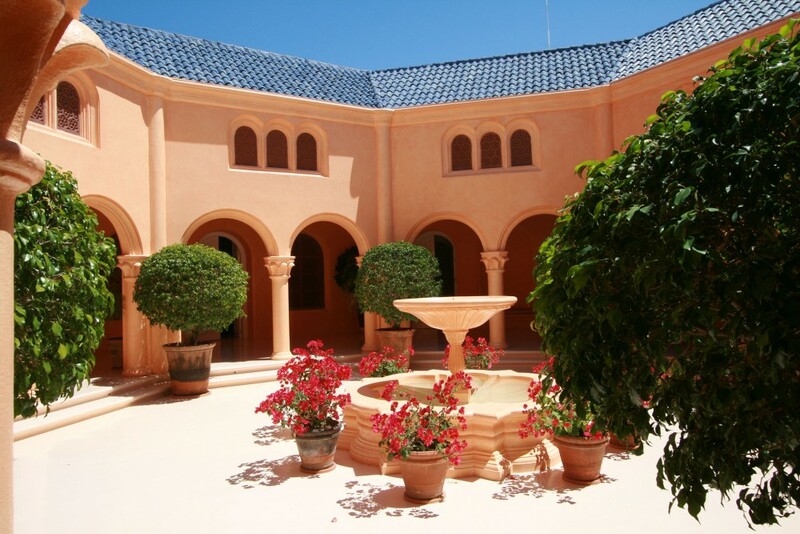 Casa Torre has been recently refurbished and extended, and is the most modern of the four villas in style. We highly recommend this villa for up to four couples traveling together, since the bedrooms are quite separate. Two are located in the main section of the house and two by the swimming pool. 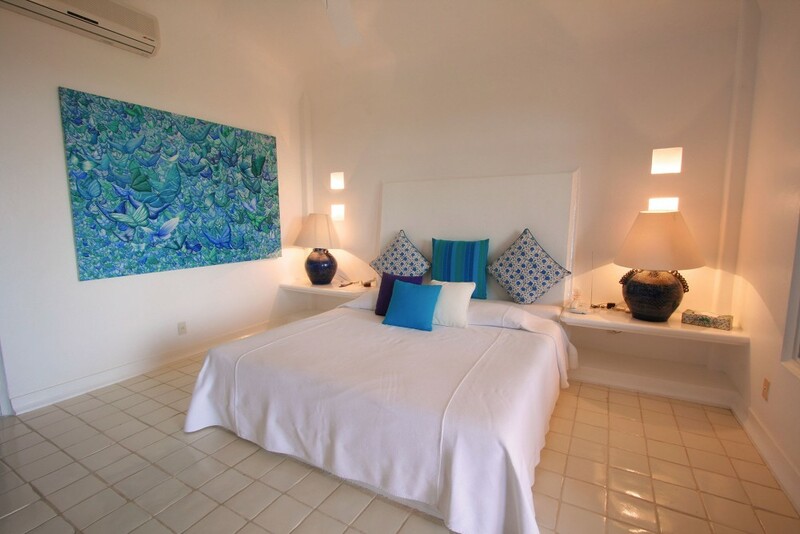 The two bedrooms that are closest to the pool are furnished in modern, minimalist style. They have large bathrooms with magnificent rain showers. 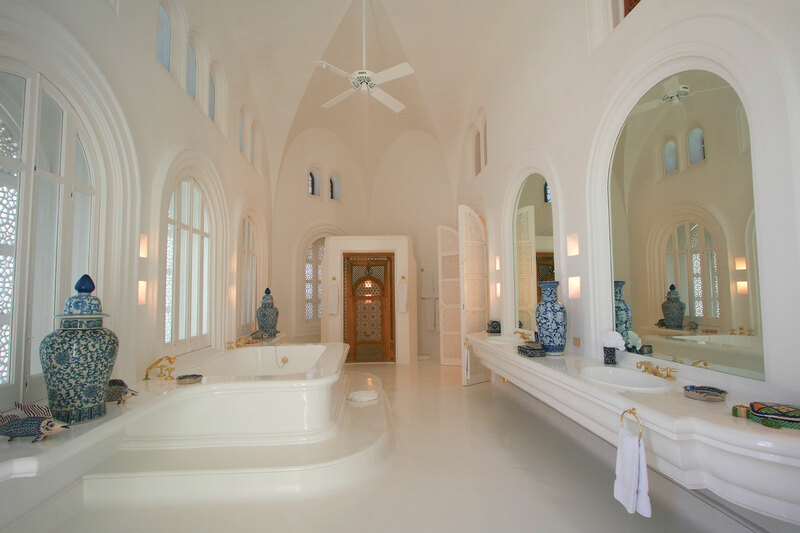 One bathroom has a freestanding oval tub. 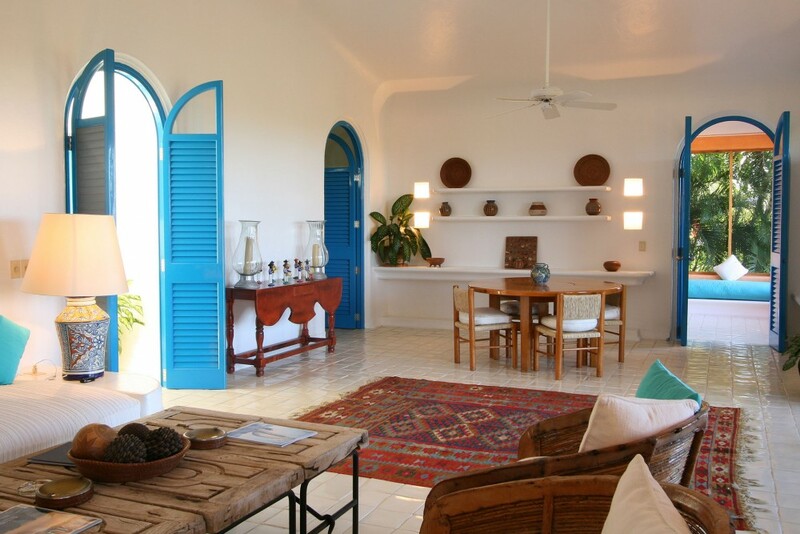 The remaining two bedrooms in the main house are more traditional and tropical in design. 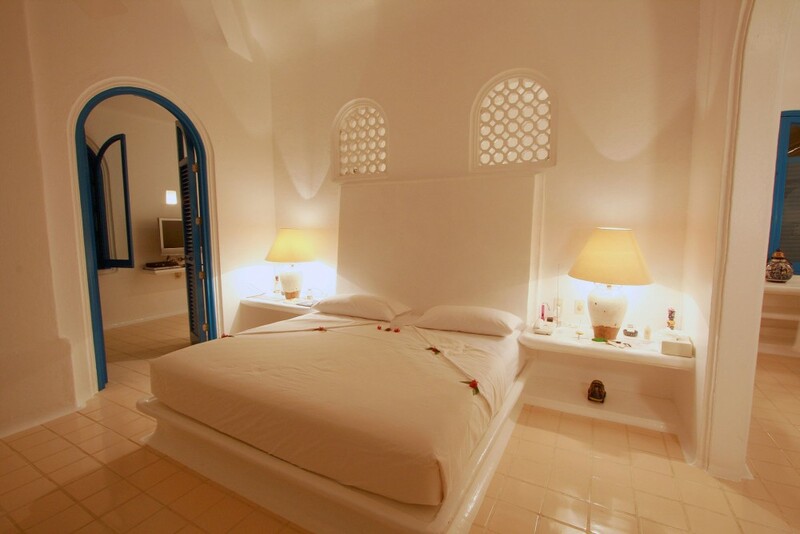 These bedrooms are closer to the charming covered veranda and the casa’s picturesque courtyard. All the bedrooms are air-conditioned. 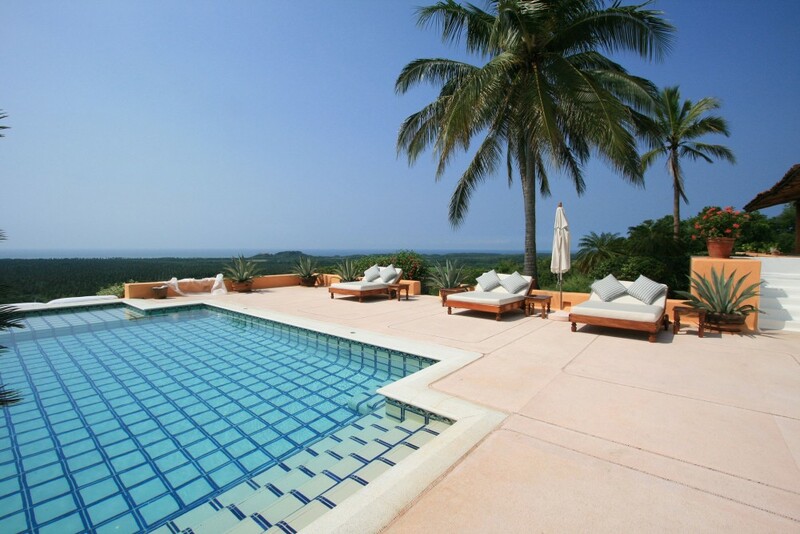 The fabulous infinity pool at Casa Torre is one of the most picturesque swimming pools we’ve seen. The pool is long and deep; perfect for swimming. It doesn’t have a shallow section for children. 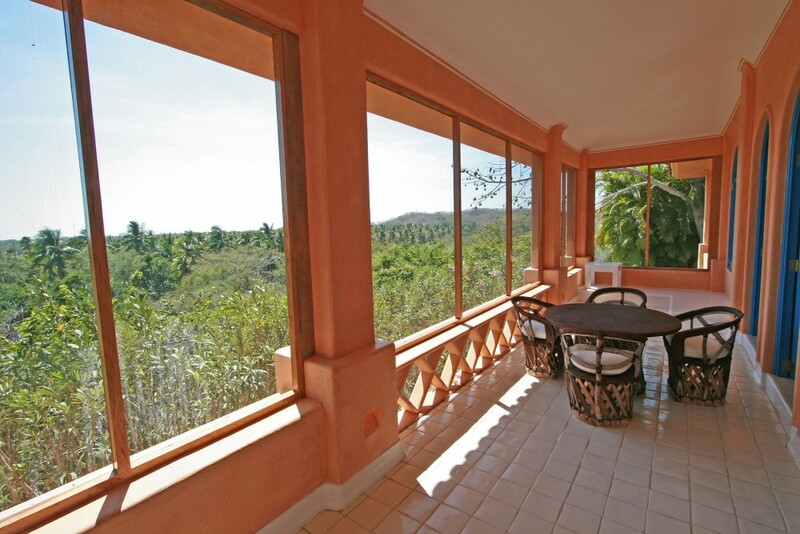 Casa Alborada also has far reaching views of the estate, which includes lagoons and forests. This villa features indulgent indoor and outdoor living spaces and is perfect for a family or for friends traveling together. 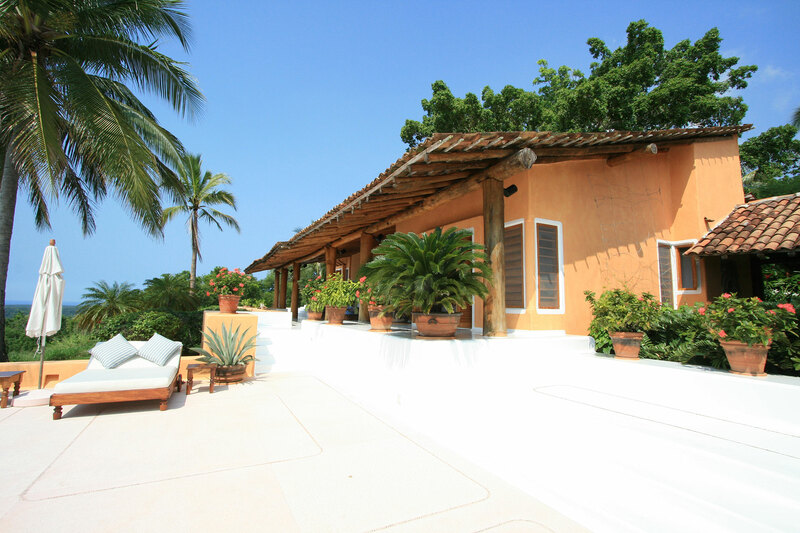 Casa Alborada features three similarly sized bedrooms, each with a king bed and ensuite bathroom. There is also a spacious TV room which has two queen beds and a bathroom. All of these rooms are air-conditioned. 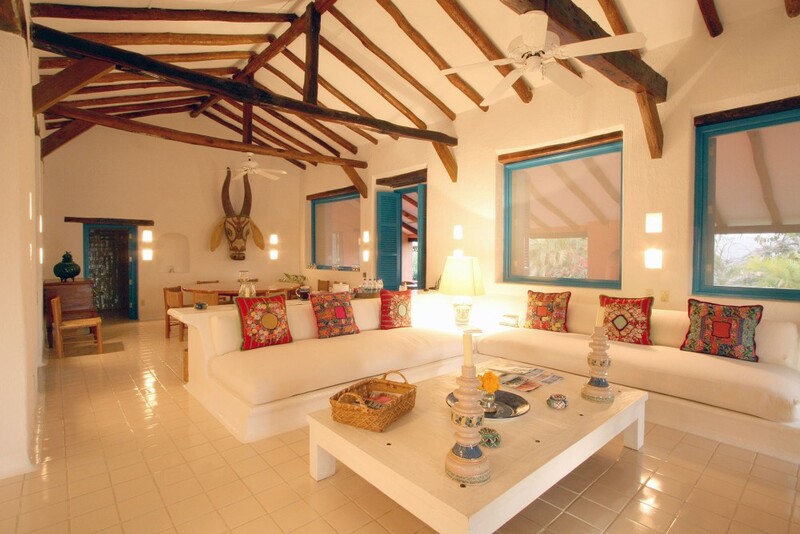 The sunny and spacious sitting rooms are furnished in vibrant colors to reflect the exotic climate. The outdoor sitting room is especially delightful, and provides a shady and breezy place to relax when the sun is at its peak. 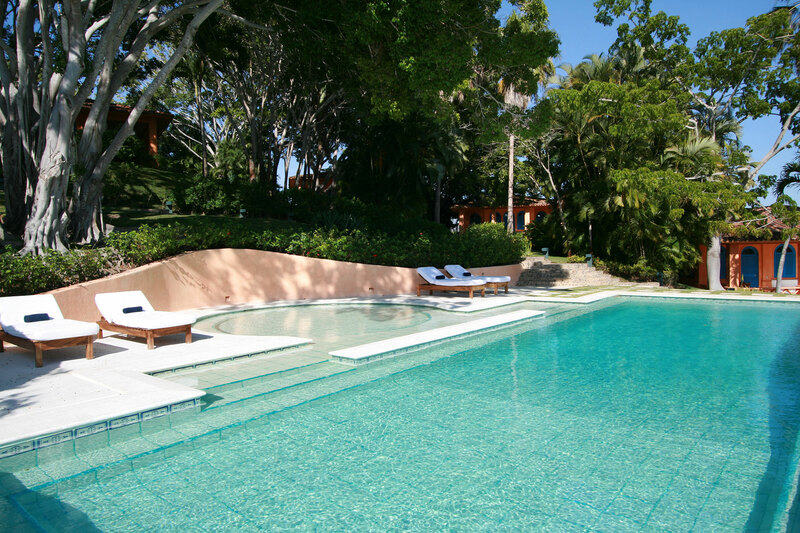 The magnificent swimming pool is sure to be a favorite place for Casa Alborada’s guests to gather together during the daytime. There are also beautiful beaches within easy reach – car rental is essential at Cuixmala since the estate is so large. 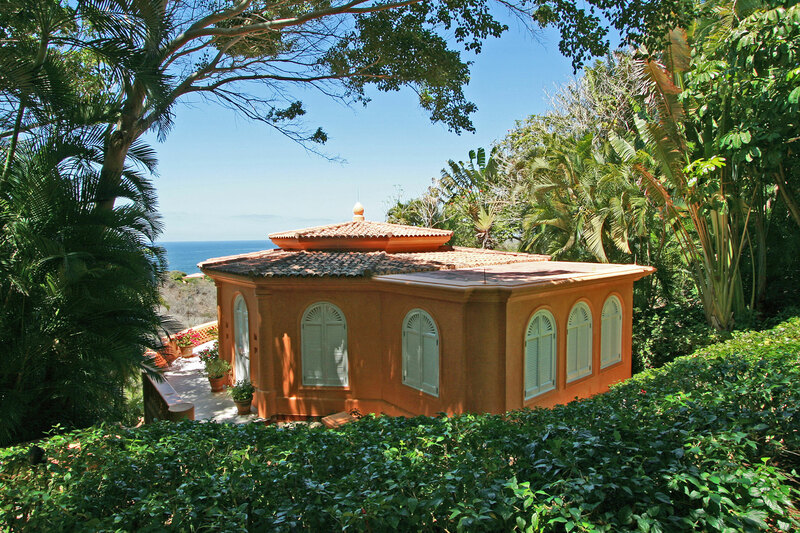 Casa Gomez is the Club House and Restaurant for the casitas. Fresh organic produce from the estate’s ranch and hacienda are served here. One day we enjoyed delicious mahi mahi fillets cooked in white wine served with saffron rice for dinner. A tasty salad with tortilla strips was served as an appetizer, and home made apple tart tatin to follow. We’d been advise to take dinner early as the latest family of baby turtles were due to be released on the beach that evening. Dinner was delicious, but on that day we didn’t linger after dessert; prefering to follow the other guests down to the beach to see the turtles take their first dip in the ocean. Breakfast is included in the rates for guests in the casitas. As well as organic fruit and juice from the estate, fresh coffee from the ranch and eggs cooked to your liking, there is always a special home made treat. One day we enjoyed freshly baked banana bread, and on another morning wonderful coffee muffins. Should you wish to try some of the nearby restaurants, there are a few options just a short drive away. The staff can recommend simple restaurants in the local village, as well as Italian cuisine at the nearly Polo club or a good beach restaurant for lunch. However, it’s hard to beat the freshness and quality of the meals at Casa Gomez. 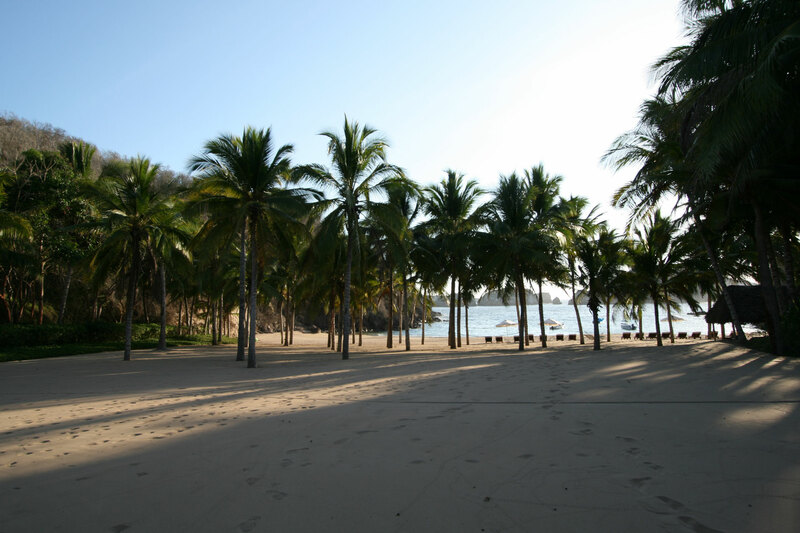 Cuixmala’s vast estate is fringed by beautiful beaches. 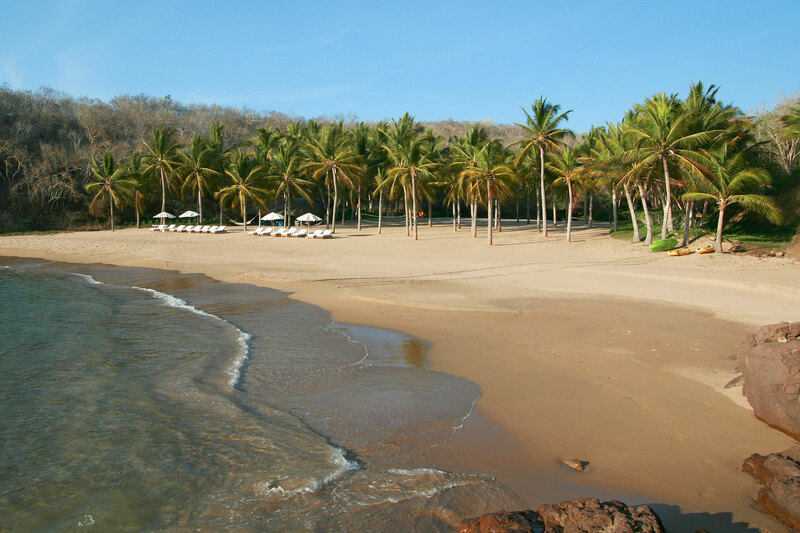 The beach nearest to the villa La Loma is a spectacular long stretch of unspoilt coastline. This beach isn’t generally suitable for swimming. Caleta Blanca is a beautiful safe beach located about thirty minute’s drive away from the casitas. It’s a private beach owned by the Cuixmala estate and you are likely to have this little paradise all to yourselves. 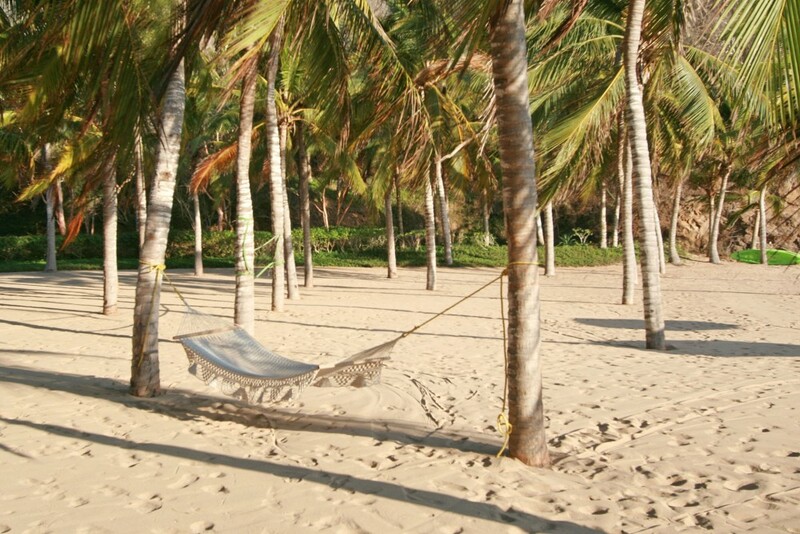 Snorkeling and kayaking can be enjoyed here, and there are also hammocks for pure relaxation. 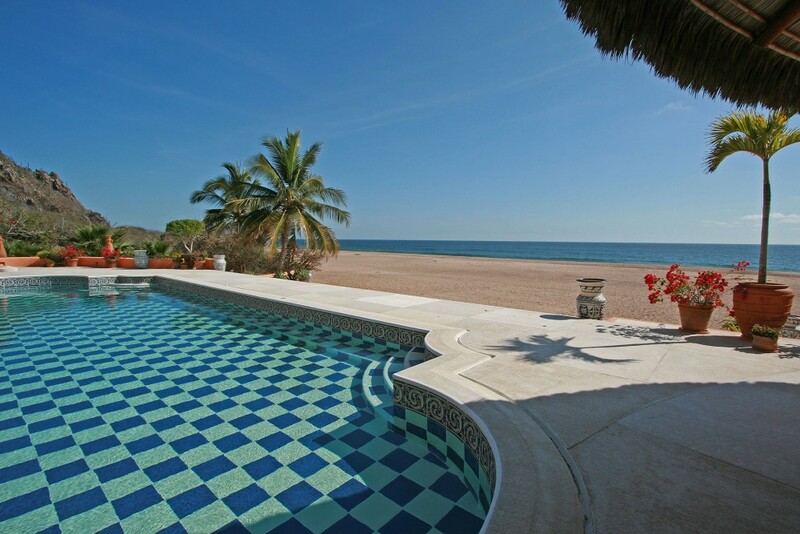 This lovely, large pool is for the use of the casita guests only. It’s around fifty feet long by 20 feet wide and has a very shallow splash area for young children. 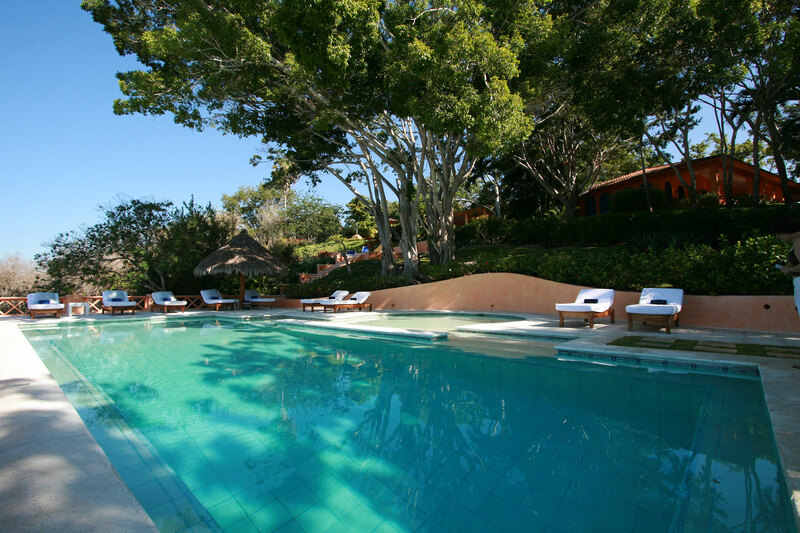 The pool is surrounded by sunbeds that are shaded by palapa or by the large trees. 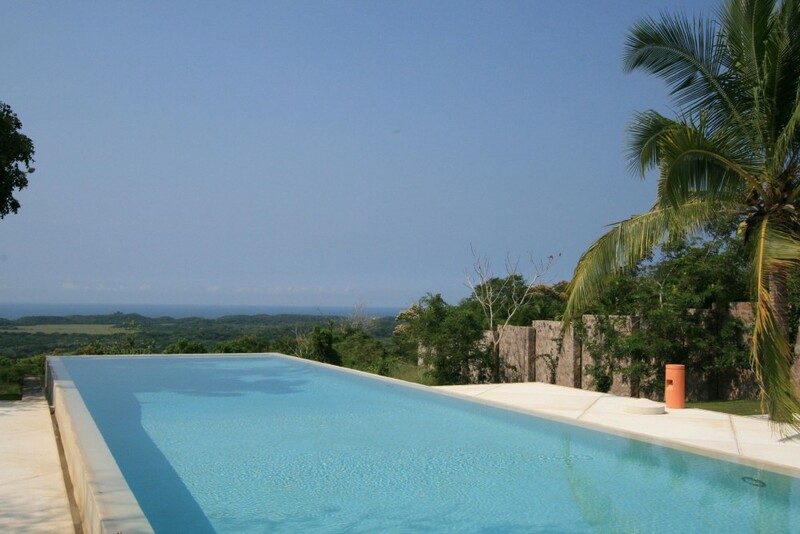 Bathers can enjoy far reaching views of the estate, with the villa la Loma and the ocean visible on the horizon. 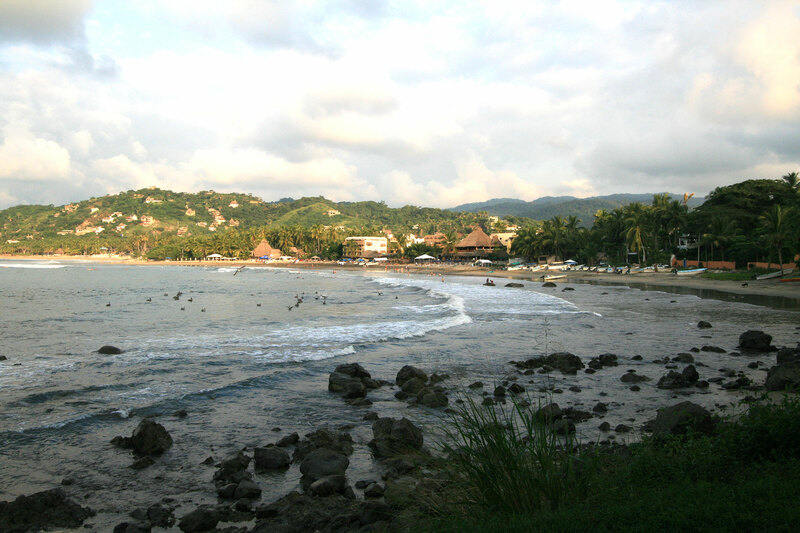 The closest airport is Manzanillo, about 90 minutes (50 miles) away by road. 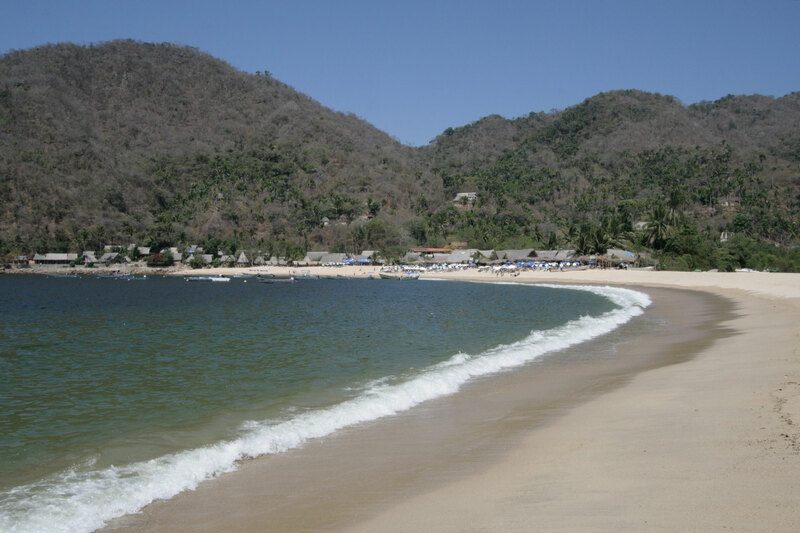 Puerto Vallarta airport is about 3 hours away by road (115 miles). Driving directions will be given on reservation. The entrance is not signed.